Thanks in part to the fact that every player voted for himself as best all-around player at the inaugural edition of the World Series of Poker, a change needed to take place in the format of the event for the sophomore edition. In 1971, the WSOP changed to a freezeout tournament, meaning that the last man standing with all the chips would be crowned World Champion. Each player would pay a $5,000 buy-in and the prize was winner-take-all to add some drama to the procedings. Every player started with the same amount in chips, and no player could reload his stack by buying in for more. This sounds elementary by today’s tournament standards, but it was groundbreaking at a time when every poker player on the planet was used to the idea that if they ever ran out of money, they could turn to their wallet or money clip to buy back into the game. The experiment proved a success in 1971, and historically as well, considering that every WSOP main event champion has been decided by using freezeout tournament rules ever since - although the winner-take-all approach has been dropped. The media was also influential in bringing about the switch after they complained about the boring nature of the first edition. Los Angeles Times reporter Ted Thackrey said, “You’ve got to find a way to make it a contest…If you want to get the press involved and turn the World Series into a real sporting event, you need to give it some structure, create some drama, and make it a real tournament.” This is also one of the first times the idea of poker as sport, or poker covered by the media as a sport is documented. 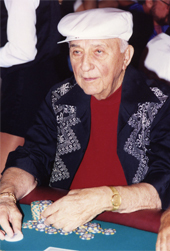 Johnny Moss, Jack "Treetop" Straus, "Puggy" Pearson, Jimmy Casella, "Sailor" Roberts, Doyle Brunson, and "Amarillo Slim" Preston paid the $5,000 entry fee, and took their seats to decide the second world champion of poker. No records or notes were kept on the event, but it is known that it lasted two days, and that Pearson faced off with Moss head’s-up in the end. The “Grand Old Man of Poker” defeated Pearson and he won his second WSOP titile in a row, along with $35,000. “Moss won that event…so it does show [in 1970] we voted for the right guy,” later recalled Brunson of the 1971 event.